Successful Strategic Planning Starts Here. Few things are as important to nonprofit organizations as strategic planning. But if you’re like most professionals, you’ve never been taught to create a strategic plan. You Need a Strategic Plan. Without one, it's hard to prioritize and stay focused on what's really important. It outlines the benefits of strategic planning and the various approaches to the process. Plus, you’ll get a template that makes strategic planning simple for even novice planners. At under 20 pages, our guide contains ZERO fluff and is a much better value than books 15 times as long costing over $300. This Guide is truly the quickest, simplest resource to help busy nonprofit professionals kick start the strategic planning process. 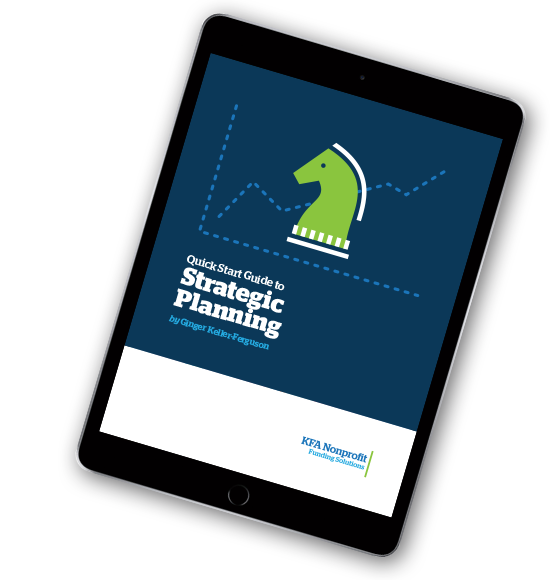 Download our Quick Start Guide to Strategic Planning and get all the tools you need to get started. Ginger is the owner and founder of KFA Nonprofit, a nonprofit management consulting firm established in 2010 and located in Johnson City, Tennessee. Ginger holds a bachelor of arts degree in technical writing and a master’s degree in business administration from East Tennessee State University. Over the past two decades, Ginger has helped secure over 30 million dollars in private, corporate, state, and federal grants for her employers and her consulting clients. KFA Nonprofit has helped dozens of nonprofits all across the country, from Sacramento, California to New York City and everywhere in between do more, better. Chelsea is a seasoned communicator who has written professionally for nearly 20 years. Chelsea has a bachelor's degree in mass communications from East Tennessee State University and a master's of business administration from King University. She started her career in journalism and has written professional communications for everyone from c-suite executives and state senators to brands such as Blue Cross Blue Shield of Tennessee, HomeAdvisor, Travelocity and eBay. From crisis management to program marketing and successful solicitations and appeals, Chelsea amplifies nonprofits’ voices to successfully connect with their audiences.